* As we reported two weeks ago, Jean-Frédéric Dufour has left his position as Zenith’s CEO in favor of Rolex. His replacement was announced this week: Aldo Magada, a man who can look back on 30 years of experience in the watch industry. He was most recently Breitling’s director of sales and business development, though he has worked at several brands big and small over the years. * Beyer Uhrenmuseum in Zurich is exhibiting the works of 16 members of the A.H.C.I. from May 6 through June 6. Andreas Strehler has lent his Sauterelle à Lune Perpétuelle as well as a table calendar clock to the exhibit, and visitors will also have the rare opportunity to personally see works by Philippe Dufour, Vianney Halter and Kari Voutilainen, all winners at the 2013 Grand Prix d’Horlogerie de Genève. Marc Jenni will personally be on hand for chats on Tuesday, May 13 and 27 between 4:00 and 6:00 pm. Works by the following members are also on display: Svend Andersen, Felix Baumgartner (Urwerk), Aaron Becsei, Vincent Calabrese, Valerii Danevych, Miki Eleta, Paul Gerber, Beat Haldimann, Frank Jutzi, Marco Lang (Lang & Heyne), and Rainer Nienaber. 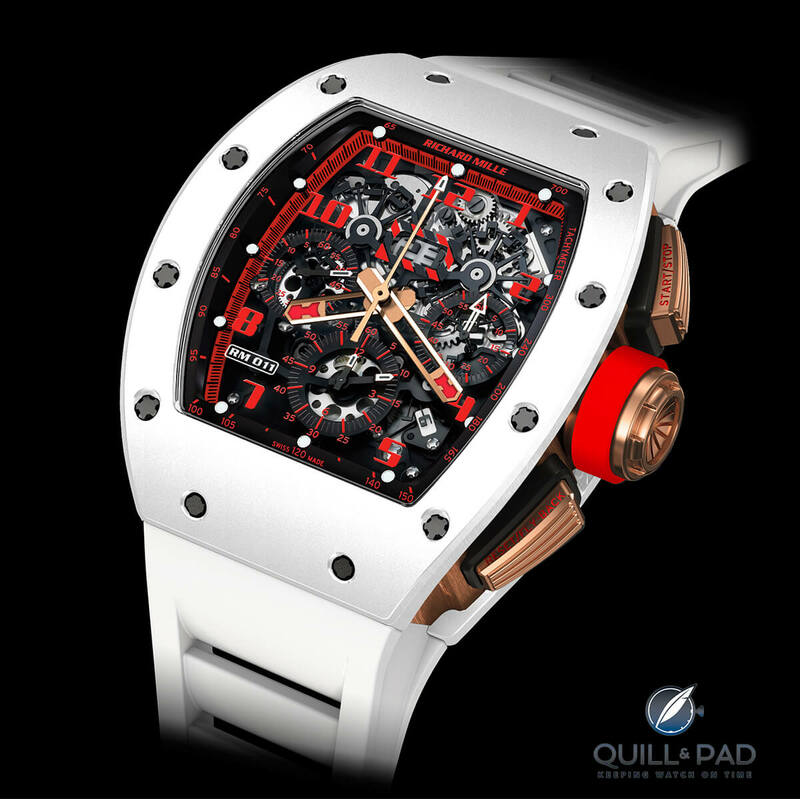 * Richard Mille announces the RM 011 Automatic Flyback Chronograph White Demon, a 30-piece limited edition available exclusively through authorized retailers in North and South America. As the sandblasted white ceramic timepiece with fire-red details combines red gold with high-tech materials and aggressive styling, it may be easy to forget that this is a fully functional sports watch. In fact, it also includes major technical innovations such as its skeletonized automatic movement with adjustable rotor geometry as well as an annual calendar. On a white rubber strap, it retails for $170,000. * Audemars Piguet and National Basketball Association (NBA) team Atlanta Hawks announce a corporate partnership, marking the Le Brassus-based brand’s first with a professional sports team in the United States. AP will serve as the Hawks’ official timekeeper, thereby exclusively presenting the two-minute warning in the second quarter and the final minute warning of the fourth quarter. Audemars Piguet will also present the “countdown to tip-off,” a 15-minute countdown before the game starts. This announcement coincides with the NBA playoffs, which are currently taking place in the United States. * Shinji Hattori, chairman and group CEO of Seiko Holdings Corporation and president and CEO of Seiko Watch Corporation, has been awarded a medal by the Japanese government for his contribution to the public in the domain of education, medicine, welfare and industry. Under his leadership, Seiko’s vertical integration has increased ever more. “I will continue to follow the lead set by Kintaro, my great-grandfather, and further strengthen the image of Japan’s fine watchmaking,” Hattori said. * At Richemont USA there have been some big personnel changes: Hugues de Pins has moved from president and CEO of Vacheron Constantin to vice president of marketing and communications at Cartier. Normally he would report to Emmanuel Perrin, president and CEO of Cartier USA, but Perrin has announced he will be heading to Cartier headquarters in Paris, though it is not yet clear in exactly which capacity. The affable De Pins looks back on more than 17 years of experience at Richemont. * Institutional investment firm FIDES Business Partner, based in Switzerland, has made a strategic capital investment in Antiquorum auction house with the goal of expansion into new markets. Owned by Timezone.com, Antiquorum was founded in Geneva in 1974. * American watch company Devon Works introduces a new version of the belt-driven Tread 2 called Godiva. Its name derives from the color of the case’s PVD coating: a rich, dark chocolate brown. It will begin delivery at the end of May. * Fans of rock and roll and good watches will very much appreciate this Hodinkee video in which Ben Clymer and Kiss drummer Eric Singer have a look at his extensive collection at his Hollywood home. Worth a watch! * Specialist TAG Heuer enthusiast site Calibre 11 offers a free digital download of Jack Heuer’s autobiography.